I know I have posted plenty of re-purposing projects…..and maybe you’re tired of them. But I have had an absolute ball adding to my kids wardrobe without going to the store to buy them. So if you haven’t given it a try……..go on and test it out. You’ll be so proud of yourselfwhen you’re done. Come on…..can life be any sweeter? Your very own masterpiece in a half hour. Really. Try the shirt on your little girl (or just guess) to see where you’d like the empire waist to hit her and then add another 1/2 inch for a seam allowance. Mark that length. Then decide how long you’d like the dress to be and cut off enough of the skirt to make the dress long enough and another 1/2 inch for a seam allowance. Cut both accordingly. Then, sew a large gathering stitch a 1/4 inch from the top of the skirt along the front and along the back…leaving long tails of thread to be able to pull. For more detailed instructions, visit one of my old posts here. Place the skirt and the shirt together, with right sides together. Sew along the raw edge, using a 1/2 inch seam allowance. Then zig-zag all along that raw edge. Trim if needed. Now, you can either turn right sideout and press…..and be done. Or you can continue if you have leftover scraps. 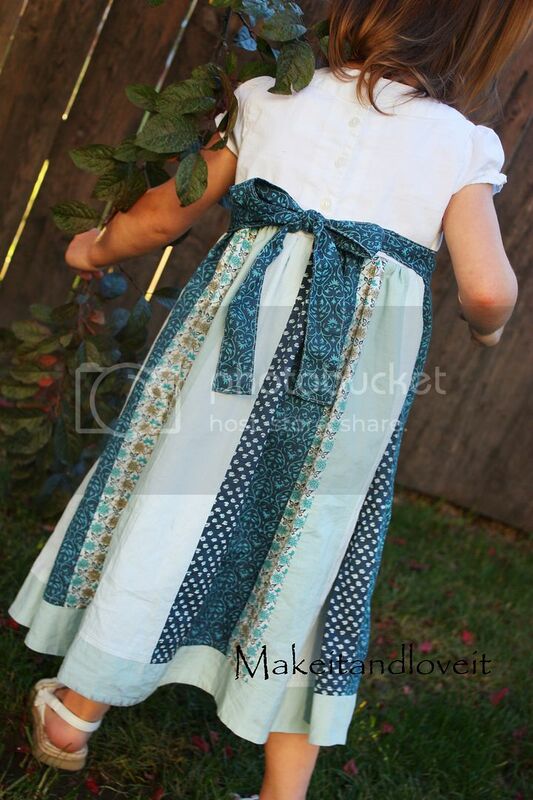 I used the waistband of the skirt to create a belt/tie for the dress. I had enough fabric to make a 1.5 inch wide by 3 foot long tie (so, about 3.5 inch wide by 3 foot long…..then folded in half lengthwise with a 1/4 inch seam allowance, turned right side out and pressed flat.) Then I tucked the ends inside itself to the center about a 1/4 inch and then top stitched around the entire thing. Then I pinned the belt/tie to the dress to the front of the dress, hiding the empire waist seam. And then I sewed along the top and the bottom of the belt/tie, backstitching several times along the sides of the dress……. Then I added a fabric flower, just like the one I made here. I know, I use them all of the time. They just add such a cute touch to everything. Love them. Then press anything else that may need it and then put your little creation on your little lady. She’ll love it…..because it’s made especially for her. « New sponsor and GIVEAWAY….are you ready??? Just found your blog and decided to be a follower. The dress and the ease of how it is made is fantabulous! You always have the cutest coordinating fabric, skirts, shirts, etc. to repurpose! This is so cute and clever too! AHHH! I Love this idea. SOOO cute! I too love the repurposing posts! As usual, lovely! Okay. THat turned out just darling. I mean, I have loved ALL of your repurposed projects, but this one just about wins. It is just so sweet. Nice work! Absolutely adorable!! I am going to have to try that for Kalyssa!!! I love this idea. I have a skirt that I never wear and I've been debating on what I want to do with it. A saia estava meio retrô, mas o vestidinho ficou um charme! I have done this but I have to say that your re-purpose of the skirt/shirt is darling… It makes me want to go in my closet and see what else I can come up with! It's great! Ive got to try!!! my sister sent me this and I love it! I'm now following your blog :) so lovely. can't wait for my baby to be big enough to make such fun things for her, so creative. thanks! Too too cute!!! I love a good skirt redo! amazing; you just keep on surprising me, with more and more creative ideas! Another fabulous idea! I love it! Okay, as someone who isn't applying for grad school and whose budget is okay (not huge, but okay :) ), let me say that I LOVE your repurposing ideas and I will NEVER get tired of them. You do such an amazing job! Thanks for your blog!! b) head to goodwill/ mom's DI pile! Thank you! Love it! Keep 'em coming! Oh my heck! I have that same skirt! I'll definately have to try this for my little girl. It turned out so cute! Good job! this is amazing. you're amazing. love it! are you kidding? who could possibly get sick of re-purposing projects?! please don't stop writing about them!! this is so sweet, love it! cute cute cute. I love to see everyone!! That is just adorable! I for one love your repurposing ideas… it is a great way to make something new for my daughter without having to do too much work… but they always turn out so cute! Thanks so much for the work and effort you put in to your blog! I love checking it out often to see what new things you have going on! Please keep putting re-purposing tutorials on! I love them and have the perfect skirt for this one. You are so inspiring!! I am actually going to try it. THanks so much for posting these tutorials! I started following your blog because of your repurposing ideas! You inspired me! Last night, I turned my husband's torn sweater into 2 pairs of pants for my boys, size 4t and 2t. Thanks for the inspiration… pics are up on my blog if you care to see! Keep up all the excellent tutorials, they are so appreciated! Hey, i love it! wow! ^^ please visit my blog, is only a baby, but is my with my style. ca-ute! 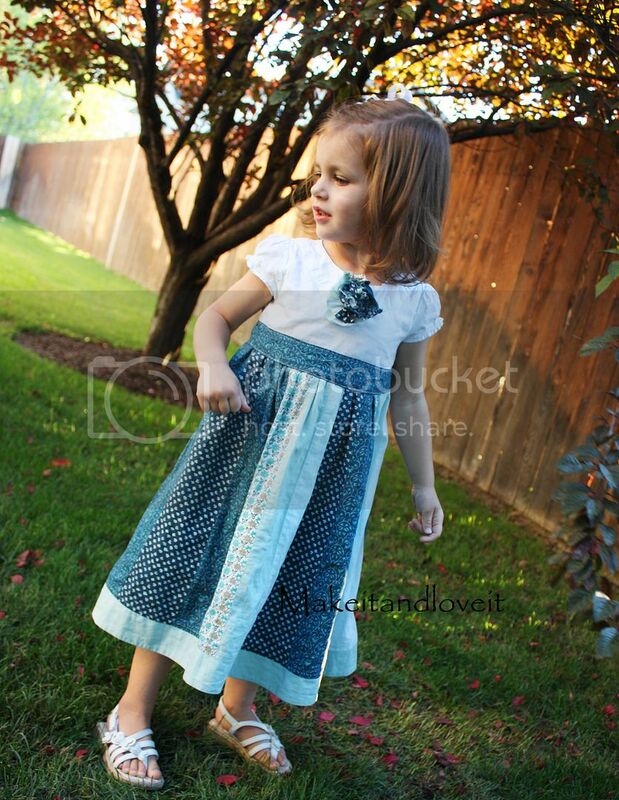 love using old skirts, etc, to make new adorable clothes! SO PRETTY! I love your creativity. I love the re-purposing projects! Now if you could come up with something I could wear — that would be amazing. Love you! Now I don't have to feel guilty if I am really sick of wearing that skirt and feel like I have been wearing it since 1985, and want to get rid of it forever. Genius! This dress turned out just beautiful! :) Thanks for sharing! I have this skirt! American Eagle I think. I love all your projects, especially the re-purposing ones. So fun and simple to make…great for me since I'm such a beginner. I just found this on Pinterest. I have this same skirt! I bought it at the thrift store thinking I would make it into an apron, but I love this dress! 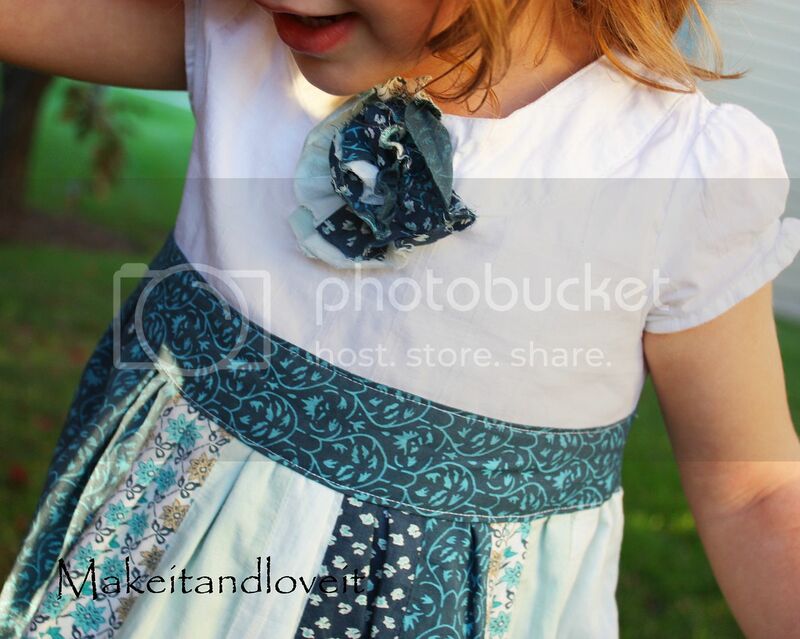 I am so going to make one for my daughter! Thanks for the great ideas on your blog!